(SPOT.ph) The arrival of P2P buses in the Metro has given commuters an easier and more convenient option to get around the city. And with these new buses, you can make your commute more comfortable, too. Bus company Froelich Tours announced that it will be launching additional daily round trips for its Trinoma to Park Square, Makati route using the VIP Neoplan Skyliner bus—the only unit of its kind in Southeast Asia. The premium bus will be deployed starting September 1, and will be operational from Mondays to Saturdays. Bus fare costs P100 for a single-journey ticket, with a discounted price of P80 (applicable for students, senior citizens, pregnant women, and persons with disability). The Skyliner double-decker bus is fitted with plush seats for the comfort of its passengers. A dedicated stewardess will be on-board every trip for ticketing and passenger assistance. The VIP bus rides will only be available for one-way trips on a cash-ticketing basis, and is not available for monthly or weekly bus pass holders and beep card users. 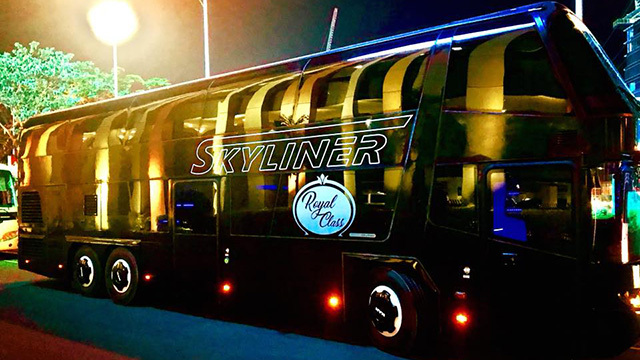 The premium VIP Neoplan Skyliner bus will be deployed for four daily round trips—departure schedules at Trinoma will be at 6:30 a.m., 8:30 a.m., 7 p.m., and 10 p.m., while departure trips will leave Park Square at 7:30 a.m., 5:30 p.m., 8:30 p.m., and 11:00 p.m.
For updates, log on to the P2P Premium Bus Service's Facebook page.